When I helped my 86 year old mom self-publish her childhood memories, I also took on the job as PR person for the book. I posted blurbs all over the Internet, sent postcards to libraries and helped arrange author talks and book signings. 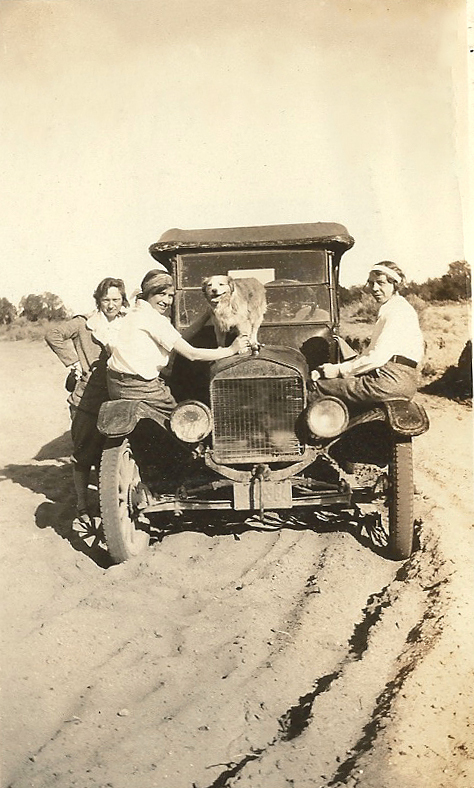 We sent this postcard to libraries in Kansas to promote my mother’s memoir. One fun way to promote the book was with a t-shirt. You can get these printed up locally or use a site like Zazzle or Vistaprint. Get everyone in the family to wear the shirts. Have them prepped to talk enthusiastically about the book when someone asks them. A sunflower seemed like a good match for a Kansas memoir. I ordered this t-shirt from Vistaprint to promote My Flint Hills Childhood. Make sure they know where people can buy the book too. 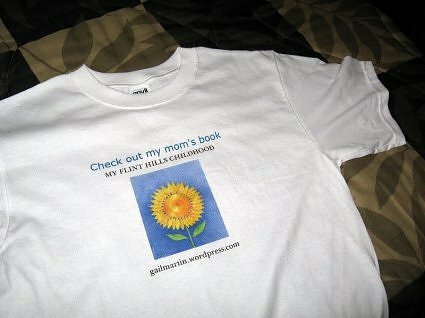 With the t-shirts, friends and family can become walking billboards promoting the book. Besides being available online (see below), we made the books available at the Kansas Oil Museum in El Dorado, Kansas and at the Greenwood County Historical Museum in Eureka, Kansas. Have you written a book? If so, then you know that promoting the book is a lot of work. Here’s my mother’s memoir. It won the 2010 Ferguson Kansas History Book award. Mom’s stories plus some of mine and my sisters were compiled in this book about my dad. I’ve been lax about keeping up with the Blog Every Day in May challenge. It has inspired me to write more here than I might otherwise. The topic for today is “What’s on your plate?” Now I could write about food, but the question makes me think of all the things I want to get done. Mom and I were collaborating on two family books before she died. One was about her aunt, Bertha McGhee, and the other was about her great-grandfather, Abraham Bates Tower. She had some primary source material on both of them and some memories of her aunt. I rue that I didn’t ask her more questions on the two topics. 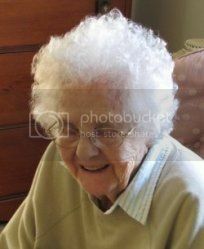 She had sent home with me the letters, the diary, and other notes, photos and memorabilia on the two relatives. I’ve been diligently researching and reading up on background information to add to the books. It feels like a huge project, so I need to break each one down into sections and focus on working my way through a section at a time. Maybe then I won’t feel so ineffectual in the progress on the books. I’ve been dragging my feet on transcribing 40 years of Aunt Bertha’s letters. Fortunately her handwriting is fairly clear. I need to do it soon, as there are still some relatives who can answer questions that may turn up from the letters. Here’s Bertha McGhee (on the right) in New Mexico with some of the other teachers from the Navajo school. Maybe we should all make a list of truths that we discover during our lives. We could leave these lists for our children to guide them through the pitfalls they are sure to encounter. Mom often raced to get a meal on the table for her hungry husband and six children. Supper time sneaked up on her as she worked on a craft project, read a book or helped a child with their 4-H activity. Although we loved her pot roast and the pancakes made in creative shapes, we’ll probably remember most the hours she spent showing us how to make a butterfly net or driving us to a remote location where we could find geodes for our rock collection. As I turn the page of the book I’m reading, I silently thank my mother and father for being readers. They set the example in our home and all their children became lifelong lovers of books. My whole career evolved from a love of reading. I spent thirty years as a librarian ensuring that communities had access to books through their public library. We may not have had the neatest house around and our meals weren’t always on time, but we learned to create things and to love books. That’s a legacy that I’m glad I have. The Three Silly Kittens – favorite stories from childhood. It seems I get haphazard in my postings when I don’t have a challenge goading me on. Luckily I stumbled on one called Blog Every Day in May. It even offers prompts to inspire you. I have one that’s calling to me. It’s from my mother’s bookshelf of Kansas authors. The title is They Named Me Ethel and the author is Ethel Adams June. 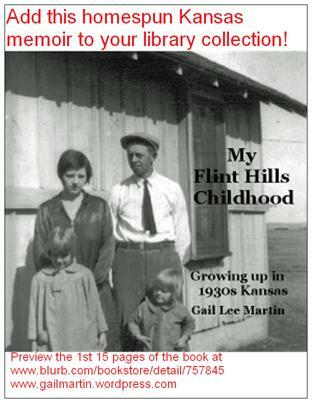 The memoir tells of a 1920s childhood growing up on a farm southeast of Wichita, Kansas, near Mulvane. 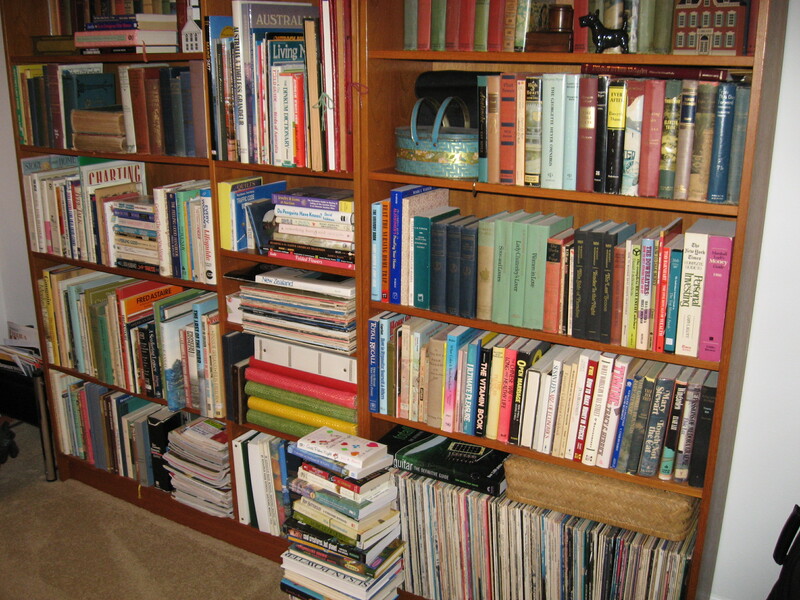 Mom and Dad always had more books than would fit on the bookshelves. There were stacks of books on side tables and on the floor next to the television. This vintage Kansas author was a favorite of my mom as she remembered reading Price of the Prairie with her parents in the evenings before the time of radio and television. 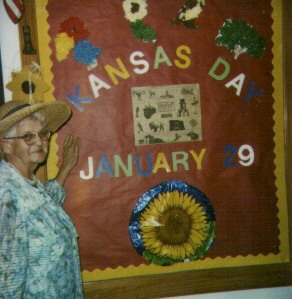 She was delighted to discover that the author had been a member of Kansas Authors Club. When KAC encouraged its members to promote Kansas authors and to encourage school children in writing, Mom chose McCarter to promote. Gail Lee Martin visits local schools with Margaret Hill McCarter presentation. She volunteered to visit local classrooms to give a first person presentation on the writer. Dressed in costume, she talked about what inspired her writing. Teachers loved the idea and the kids enjoyed a break from tests and assignments. 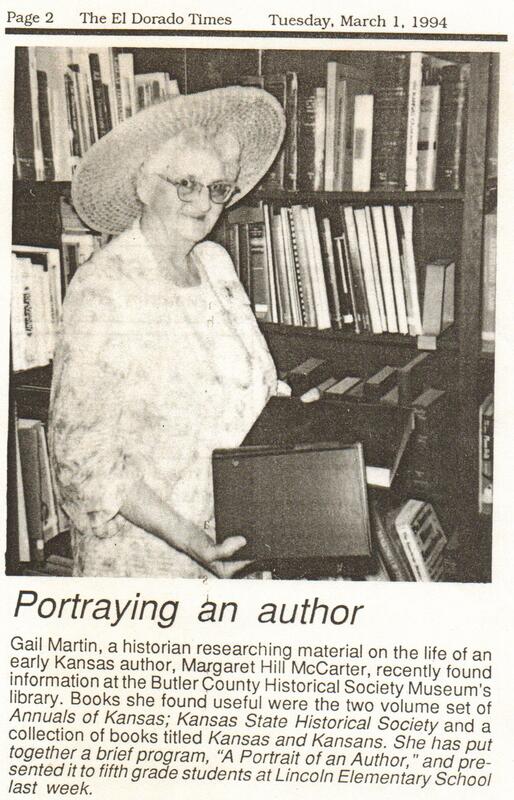 Gail Martin portraying Kansas author Margaret Hill McCarter. When my siblings wanted to tease me, they called me Vinegar Gin. My usual nickname was Ginger, so that was fairly creative of them. Mom and Dad had named me Virginia but always called me Ginger. Mom told us the source of her name, Gail Lee, was from a book her mother was reading. It was The Enchanted Hill by Peter B. Kyne. Lee was the hero and he fell in love with a woman named Gail. Mom’s name was a combination of the two characters. “I was teased in school about my freckles until I read the story Freckles by Gene Stratton-Porter. Then I was proud to be called that.